Geraniums (Pelargonium) are naturally found in the eastern Mediterranean, as well as other temperate regions of the world. They are suitable for 4-inch and 6-inch pots and mixed containers. They can also be grown as bedding plants, or as hanging baskets in full sun. 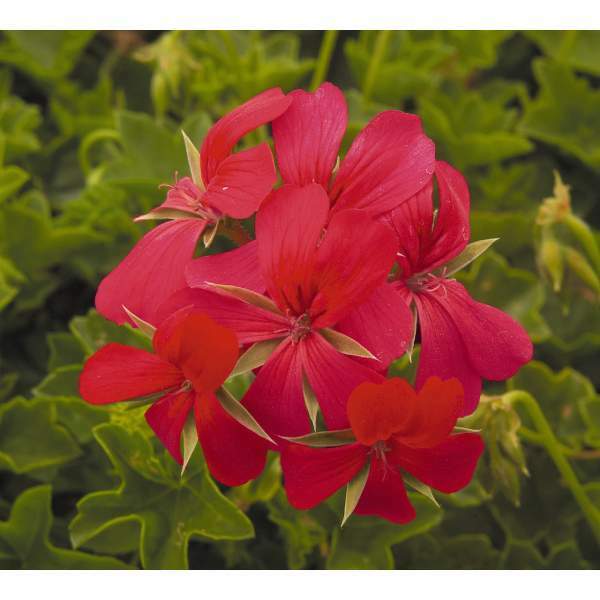 Geraniums have compact dark foliage, and your customers will appreciate that Geraniums are easy to care for. If Geraniums are grown outdoors, they can be dug up and brought inside for the winter. We recommend that you first pinch Ivy Minicascade Red 5-10 days after transplanting to your final container. Pinch periodically to keep the plant stout and bushy. Geraniums should be spaced adequately to allow airflow and light penetration between the foliage. We do not recommend PGRs for Geraniums. Aphids and thrips are the primary pests attracted to Geraniums. Ivy Minicascade Red are not prone to many diseases, but watch for botrytis while the days are short. This grey rot is usually associated with wet or humid conditions. You can prevent botrytis by allowing the plant to dry out between waterings, allowing for good airflow in your greenhouse, and spacing to allow the sun to penetrate to the soil level. The most common chemicals used to treat botrytis are Medallion and Banrot. Use them as a drench according to each label’s instructions. Pinch Ivy Minicascade Red 5-10 days after transplanting to your final container, then as needed to maintain a bushy shape.